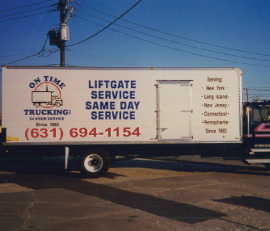 On Time Trucking is a trucking company in Farmingdale, New York, offering fast and reliable lift gate delivery at affordable rates. We are equipped with modern truck units to deliver your products and parcels within the same day. On Time Trucking is owned and managed by Daniel Leitgeb. We have 36 years of experience providing professional trucking services in and around New York and the Tri-State area. We commit to deliver your products on time and to expand to meet the demands of all our customers. We have tractors and straight box trucks available 24 hours a day. On Time Trucking is a top provider of consistent and reliable service with a long and proud tradition in the NY/NJ market. We focused on efficient delivery and a dedication to complete customer satisfaction. We are a growing service provider in the regional LTL market who is committed to the never ending quest for service excellence. The business has been built on four principles, on-time service, exception free handling, accurate invoicing, and complete customer satisfaction. We are a premier cartage/interline service provider within the NY/NJ metro area. Today, On Time is a debt free and fully asset based transportation company with 150 employees. Our fleet consists of a combination of tractors, straight trucks and trailers. We currently have one terminal which is located in Farmingdale, NY 11735 with 28 doors and 50,000 square feet of cross dock and 12 doors and 10,000 square feet on the same side. We have a combined 60,000 square feet of warehousing, 40 doors, 24 hour security with over 120 cameras, 18 month surveillance storage retention along with a 24 hour security monitoring company. We are staffed 24/7 to provide immediate customer service. We partner with Estes-Express, FedEx Freight, as well as many other national and regional brands. We offer a price competitive next day pallet program and provide spot pricing on heavy LTL shipments as well. We provide a full complement of services, inside delivery to any floor, lift gate service, two men delivery in Manhattan, package removal, weekend, holiday and off hours, residential and rural area delivery just to name a few. Our mission is to offer customers attractive, value proposition, reliable, competitive LTL transportation services. Our clients save money as we continue to seek ways to lower costs while enhancing services. In short, we offer customers a Value Proposition. They can choose any provider to transport their goods; they choose us because we offer exceptional “Value for Service”. Contact Daniel Leitgeb or Frank Tomasula 631-694-1154 directly to discuss how we can both benefit in today’s constantly changing environment. We look forward to you allowing us a future meeting to develop our business relationship. On Time Trucking offers customers an attractive value proposition for reliable, competitive and consistent LTL transportation services within a corporate environment of talented employees pursuing rewarding, challenging careers. As a new or perspective customer, you are probably wondering what type of company you should choose to handle your product. You might also like to know On Time is a privately held, family owned, union free company, and we are proud of it. Our roots go deep and our employees are passionate about what they do. On Time Trucking is a fully asset based transportation company, started in 1983 by owner Daniel (Danny) Leitgeb with one truck and a desire to succeed. Danny continues to lead On Time Trucking through innovative, strategic changes to keep us at the fore-front of the industry and maintain our growth as we became a world class service provider. On Time Trucking is an LTL (Less Than Truckload) cartage service provider. Our clients save money as we continue to seek ways to lower costs while enhancing services. In short, we offer customers a Value Proposition. Customers can choose any provider to transport their goods; they choose us because we offer exceptional “value-for-service”. Today we are the premier cartage/interline service provider within the NY/NJ metro area. From our location, Farmingdale, NY, we are able to provide reliable LTL and TL cartage services for premier national LTL/TL carriers. Daniel Leitgeb dreamed of becoming a truck driver when he was a child. His dream inspired him to start the business and accomplish his goal to become successful in the industry. His dedication and hard work has made On Time Trucking the largest trucking cartage agent in the New York metropolitan area. Contact us for more information about our trucking company in Farmingdale, New York.